The competition shortlist of thirty films will be announced on the 30th September, along with synopses and stills, at www.obheal.ie/poetryfilm. These will be screened at the Smurfit Theatre (Firkin Crane) on Shandon, in two parts. 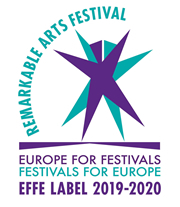 They have been chosen from over sixty submissions of poetry-films completed in the last two years, and represent 13 countries: Beligum, UK, Brazil, Ireland, USA, Spain, Ukraine, Germany, Italy, Philipines, Sweden, Ireland, Canada and Russia. This year’s judges, Patrick Cotter and Padraig Trehy will select one overall winner to receive the Ó Bhéal-IndieCork festival award for best poetry film, at the awards ceremony. PoetryFilm‘s Zata Banks will introduce a curated selection of short film artworks, chosen for their alignment with poetic structures and experiences, and with the visual, verbal and aural languages of poetry in various forms. PoetryFilm is the influential research art project founded by British artist Zata Banks in 2002, exploring and exhibiting experimental text / image / sound material. Complete details plus the competition programme will be at this link from 30th Sept.
You can listen to Breda’s reading here. Mike Mac Domhnaill won RTÉ’s Francis MacManus Short Story Award in 2013. He has had numerous poems and short stories published in Nua-Aois, An Cloigeann is a Luach, The Stony Thursday Book, Microphone On, Dal gCais, LÁ, Weekly Observer, Limerick Leader and Feasta. He has two books of poetry: Mac Baintrí/Widow’s Son (2009) and Macalla Maidu (2013, Coiscéim). He lives in Newcastle West, County Limerick. You can listen to Afric & Michael reading with The Blue Notes here. The videos of Afric & Michael reading are here. You can listen to The Blue Notes playing during the audience break here. Ó Bhéal has hosted a jazz-poetry night every year since 2008, to coincide with the Cork Jazz Festival, and it’s one of the series’ most popular events. The night begins at 9.30pm with the five word challenge, followed by guest poets Afric McGlinchey and Michael Ray. They will be accompanied by THE BLUE NOTES, courtesy of the Cork Jazz Festival. The Blue Notes feature Cormac Hennessy on double bass, Ultan Lavery on Keyboards and Jabin Ward on sax. Enjoy jazz improv sounds from this young group on the rise. Led by ace double bassist Cormac Hennessy, the musicians take a fresh approach to mainstream swinging jazz and provide the perfect backdrop for high quality jazz poetry. The trio who will also play improv to the later open-mic poetry session. Michael Ray is a visual artist and poet living in West Cork. His poems have appeared in a number of journals including: The Moth, The Irish Independent, The Shop, Abridged, Cyphers, The Penny Dreadful, Stinging Fly, Ambit, Magma and One. Noel King was born and lives in Tralee, Co Kerry. In this his 50th year, he has reached his 1000th publication of a poem, haiku or short story in magazines and journals in thirty-eight countries. His poetry collections are published by Salmon: Prophesying the Past, (2010), The Stern Wave (2013) and Sons (2015). He has edited more than fifty books of work by others and was poetry editor of Revival Literary Journal (Limerick Writers’ Centre) in 2012/13. A short story collection, The Key Signature & Other Stories will be published in 2016. You can listen to Huw’s reading here. Huw Parsons was born in 1954 in Llyswen, a village ten miles west of Hay-on-Wye on the English/Welsh border. He was educated at Brecon Boys’ Grammar School and Chelsea College of Art. He worked as a painter, film-maker, watch-repairer and photographer before starting to write poetry in 2010. His influences include the poems of John Betjeman and the song lyrics of Jake Thackray and Sting. Huw’s earlier work has been published in Country Quest, Ninnau (An American newspaper for Welsh expatriates), Artists & Illustrators, The Bulletin (An English language magazine for Brussels) and The Artist. He has recently self-published a collection of poetry entitled The Little Book of Awful Bad Poetry (Peevish Bee Books, 2010). You can listen to Jaki’s reading here. Jaki McCarrick is a graduate of Trinity College, Dublin. Her first play, The Mushroom Pickers, won the 2005 Scottish Drama Association’s National Playwriting Competition, and premiered at the Southwark Playhouse in London in May 2006 and in New York in February 2009 to numerous four-star reviews. Her play Leopoldville was selected by David Hare as a finalist in the 2010 Yale Drama Series Playwriting Competition and won the 2010 Papatango New Writing Prize and later premiered at the Tristan Bates Theatre, Covent Garden. Critic Naima Khan said of the play that it was “impossible to shake off, the effects of this show plaster themselves on its audience…a stellar script…Expect to leave shaken.” Jaki’s play, Belfast Girls, was developed at the National Theatre Studio, London, while Jaki was ‘on attachment’ to the theatre, and was shortlisted for the 2012 Susan Smith Blackburn Prize and the 2014 BBC Tony Doyle Award. It recently premiered in Chicago, staged by Artemisia, A Chicago Theater – again to magnificent reviews (“a work of tremendous imagination” Ruth Smerling). Jaki has also published poetry and short stories. Her story, The Visit, won the 2010 Wasafiri Short Fiction Prize and appears in the 2012 Anthology of Best British Short Stories (Salt). Her critically acclaimed story collection, The Scattering, was published in 2013 by Seren Books and was shortlisted for the 2014 Edge Hill Prize. In 2010 she was also announced winner of the first Liverpool Lennon (Paper) Poetry Competition by Carol Ann Duffy for her poem, ‘The Selkie of Dorinish’. She has been the Writer in Residence for the Pushkin Trust, Northern Ireland and for the Centre Culturel Irlandais in Paris. Jaki, who was longlisted this year for the inaugural Irish Fiction Laureate, is currently editing her first novel. 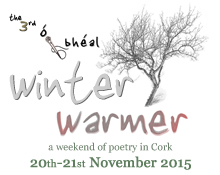 We’re pleased to announce Ó Bhéal’s third Winter Warmer festival weekend. Twenty-two poets will read and perform over two days in the amphitheatre at Sample Studios, Sullivan’s Quay, Cork. The festival will also feature poetry-films from our Poetry-Film competition, dance-poetry, poetry set to various musical acts, including sean-nós and a closed-mic set for ten local poets. Elaine Gaston is from the north coast of Ireland. Her début poetry collection The Lie of the Land was published with Doire Press in July 2015. Elaine currently holds an ACE Award for poetry from the Arts Council of Northern Ireland. She was awarded the No Alibi’s Prize at the Seamus Heaney Centre for Poetry, Queen’s University, Belfast, where she completed an M.A. (with Distinction) in 2010. She lectured in Creative Writing at Ulster University until 2014. Elaine was short-listed for the Bridport Prize 2014, won a Commendation in the National Poetry Competition 2013 and a Special Commendation in the Patrick Kavanagh Award in both 2013 and 2014. She previously won prizes in the Templar Poetry Pamphlet Competition, the Academi Cardiff International Poetry Competition (both 2008), the Peterloo Poetry Competition and the Manchester Open Poetry Competition. Her poem ‘Push-Bike’ was made into a filmpoem by the Poetry Society and directed by Robert Peake. It premiered at the Poetry International Festival at the Southbank, London, 2014. Her work has been translated into Russian and Spanish and was selected for Poetry Ireland, Introductions in 2006. Her work has appeared in the following: Poetry Ireland Review; Verse; The North; New Welsh Review; The Rialto; Buzz, Templar Poetry; Black Mountain Review; Study Ireland, Poetry, BBC 2 Northern Ireland; National Poetry Competition Pamphlet 2013, The Poetry Society; Word of Mouth, Blackstaff Press; The Honest Ulsterman; Brangle; Life and Movement, South Eastern and Social Care Trust; re-COLLECT-ing, Queen’s University, Belfast/Naughton Gallery; Manchester Poets 3, Peterloo Poets, 6. You can listen to Jennifer and Victoria reading here. Victoria Kennefick is a native of Shanagarry, Co. Cork. A Fulbright scholar, her poems have been published in Poetry (Chicago), The Stinging Fly, New Irish Writing, Bare Fiction and elsewhere. In 2013 she won the Red Line Book Festival Poetry Prize and was shortlisted for the Melita Hume Poetry Prize 2014 judged by Emily Berry. Her chapbook, White Whale (Southword Editions 2014), won the Munster Literature Centre Fool for Poetry Competition and the Saboteur Award for Best Poetry Pamphlet 2015. It is available here.